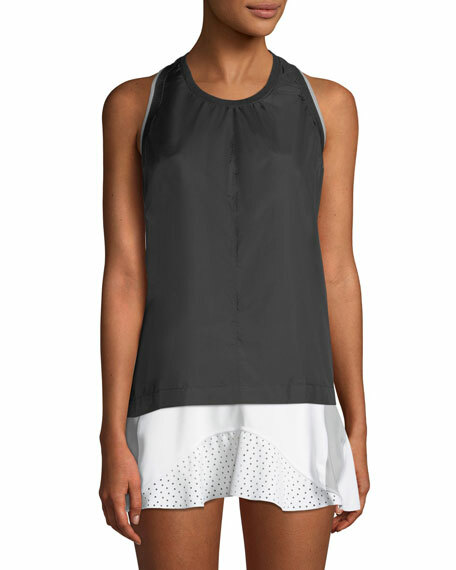 Caroline Rose ponte luxe tank. Scoop neckline. Sleeveless; bra-friendly shoulders. Relaxed fit. Side-slit hem. Pullover style. Rayon/nylon/spandex; dry clean. Made in USA of imported material. Model's measurements: Height 5'10"/177cm, bust 33"/84cm, waist 25.6"/65.2cm, hips 35.8"/91cm, dress size US 2-4/FR 34-36.